Great photograph, looking good. So glad your eye is better. 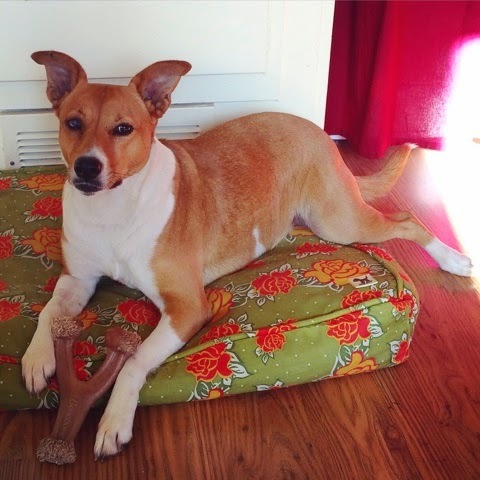 We love our Molly Mutt duvets! Yay! Very pretty tones in your photograph. It looks back to normal, yay! Burn the cone, lol! The cone is in storage - you just never know when you'll need it, but hopefully not for a very long time! That is amazing! Looking good Boca! Loving that bed too! We love our Molly Mutt duvets! I just ordered Boca a crate cover from them, too - they have the cutest patterns! Yay!! I'm such a sucker for red dogs, too (clearly ;)). Love my ginger sisters. But I also love black dogs, grey dogs, dapple dogs...hahaha...all the dogs! Hooray!!!! BOCA you are looking GREAT! She looks GREAT!! I'm so happy the surgery worked and she is back to herself again. Thanks, Jodi - I'm just thrilled with her recovery!